Good morning, everyone!! I can’t believe I’m writing to you now as a MARRIED WOMAN! How crazy! I’ll be sharing lots of wedding details with you over the next couple of months (it was the best day of my life!!! ), but I wanted to answer a few questions today about our rehearsal dinner. The dress I’m wearing is this Revolve dress with these Louboutin Degrastrass pumps. I linked up TONS of similar dresses at the bottom of this post, though! I wanted a dramatic statement-making dress for the rehearsal dinner, so I went with a long dress with a high slit. 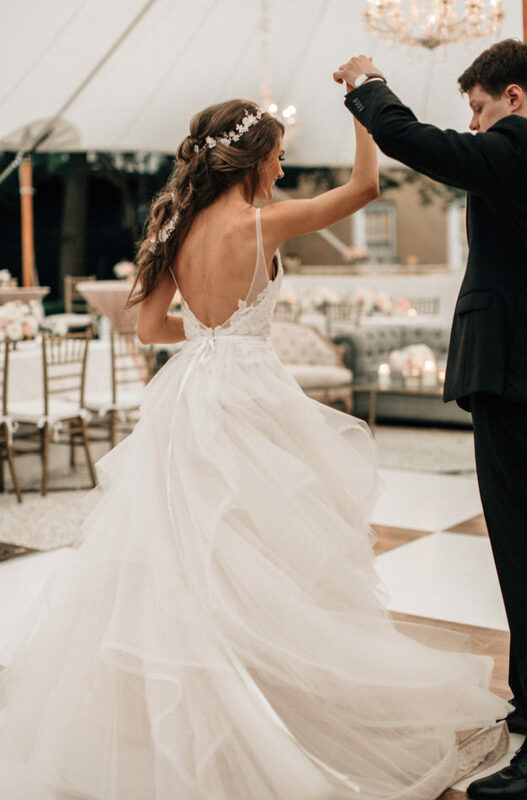 There are a lot of similar dresses that are available right now! 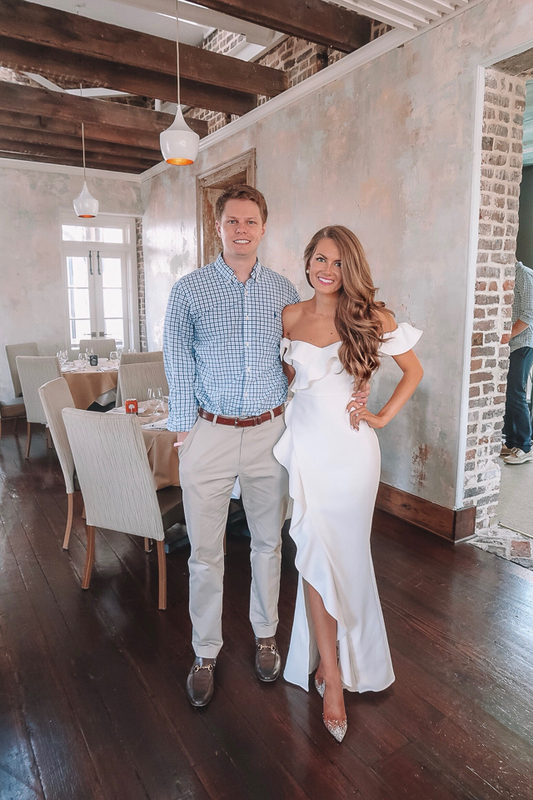 To answer some other questions about our rehearsal dinner, we held ours at the restaurant 492 on King Street in Charleston. It’s a BEAUTIFUL restaurant, and they let us have the entire top floor for our rehearsal dinner (including a rooftop patio!). For dinner we had a beet salad, a choice of beef shortrib or local caught fish, and for dessert, a molten chocolate chip cookie cake with vanilla ice cream on top. Chris’s sister made a slideshow of mine and Chris’s photos (us as babies, growing up and then photos of us together), so we watched that, and our groomsmen and bridesmaids also gave speeches. Later on in the evening, we hosted a Welcome Party, and all of our wedding guests were invited to 492 for drinks. Almost all of our guests were from out of town (and some very far away – from Wisconsin!) so it was really nice to see everyone and talk to them, since we knew that the actual wedding day would be crazy. This might be a southern tradition (y’all let me know if it isn’t!) but I got Chris a cake from Ashley Bakery for the rehearsal dinner, called a Groom’s Cake. Chris is the biggest Clemson fan in the world, so I wanted the cake to be Clemson-themed! They really brought my idea to life – a huge Clemson cooler, with real-looking ice cubes (made out of sugar!) and cans of Busch Light on top. 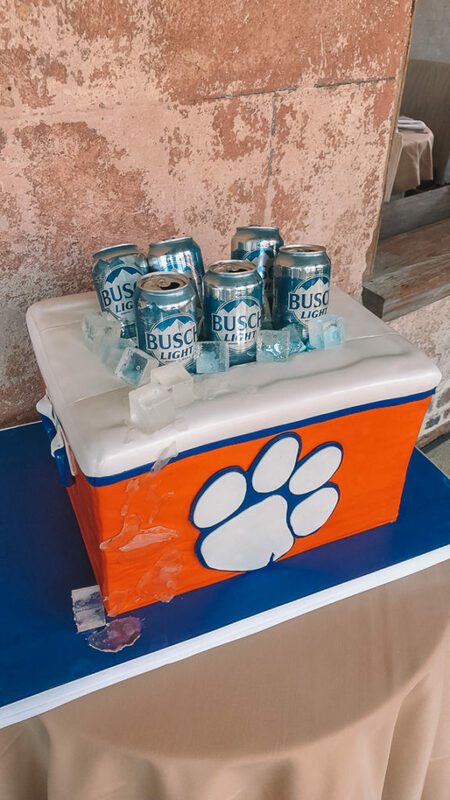 Chris looooves Busch Light so I had them put those cans as a little joke 🙂 The inside of the cake was red velvet – Chris’s favorite. We did a grooms cake too but had it at the wedding. I LOVE the idea of having it at the rehearsal dinner so much more! That’s really sweet of you to host a reception for all the guests the night before. We did a brunch the day after for the same reasons. I love this! My rehearsal dinner was one of my favorite parts of my wedding weekend to just hang out with everyone and relax. I love your outfit! I loved your dress! Everything looked so nice! Hi! LOVE the dress and your blog. Did you get a spray tan in Charleston? If so, who did you use? Love love love this outfit! The dress is to die for and those shoes are perfect! Hi Darling! Absolutely love all your wedding details! You choose the most elegant dresses! What a great venue place! Especially since you had the top floor and roof patio!! Your rehearsal dinner sounds wonderful!! Congratulations! Your wedding photos on Instagram were stunning! You looked beautiful! And I can't get over how life-like the cooler cake was! 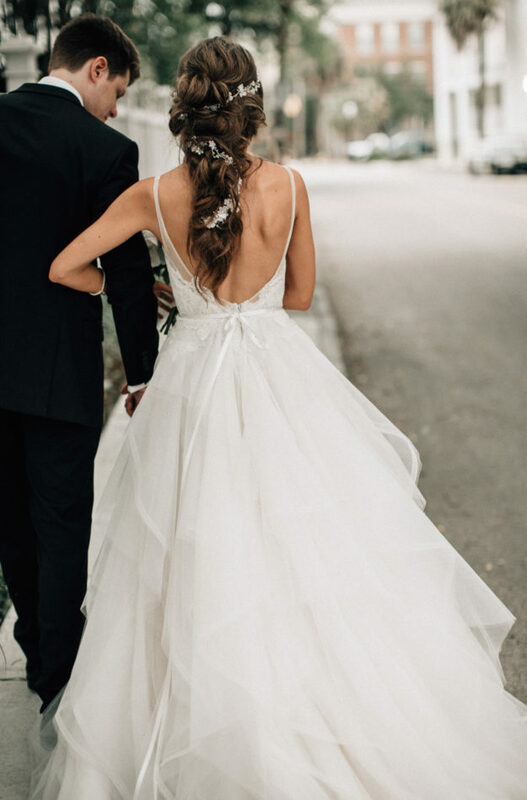 I love your dress (and your wedding dress)! Everything looked wonderful and I am so happy for you. Can you post your workout routine/eating plan to get ready for the wedding? Congratulations and have a wonderful time on your honeymoon!!! you look super pretty!! the cake is so fun !! Looks like a stunning rehearsal dinner! beautiful! 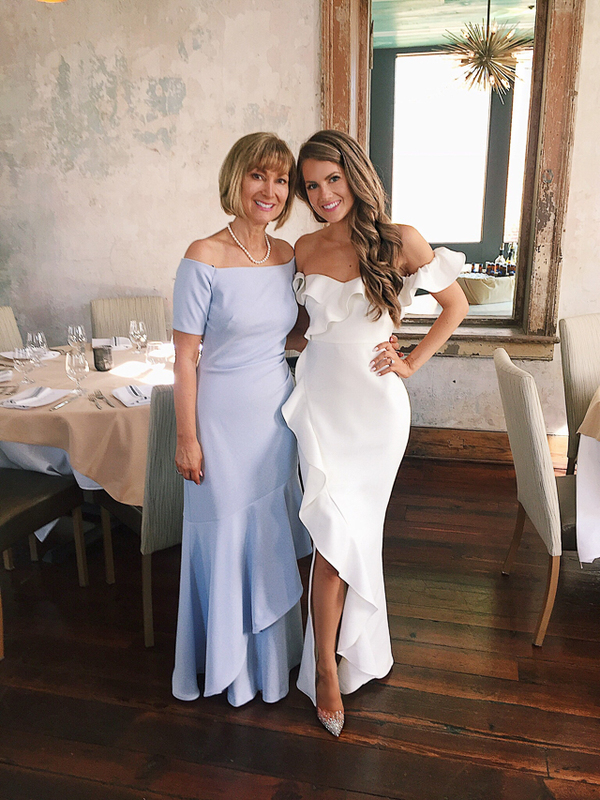 information on your Mom's dress? Congrats! That cake is amazing. Can you please share what you wore while getting ready on your wedding day?! It’s so cute & I’m getting married this year. I would get married on this dress! So stunning! Obsessed with that dress! I want to wear that for my rehearsal too in August! OMG I just stumbled across your instagram and blog, and I am LOVING you, your style, hubby and that he loves Clemson! That is my alma mater, Go Tigers!